When I was in school I remember making stacks of flash cards before tests. They weren’t very exciting but at least they were effective. But here are some cards that are so much more than basic flash cards. Check out the Vocabulary Picture Cards from Lone Star Learning! 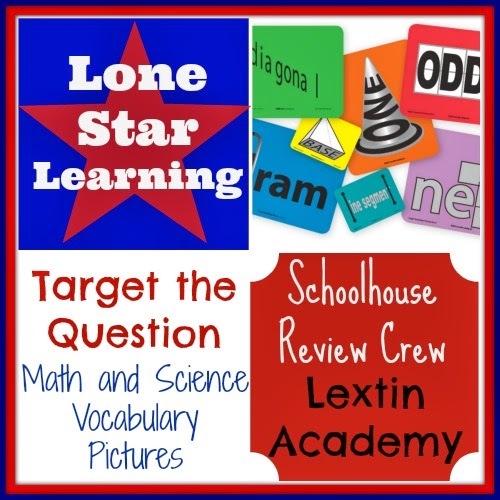 Lone Star Learning creates educational resources in a variety of subjects. Their word cards use mnemonics through colors and pictures to help students understand words and their meanings and retain the information. We were able to review 2 sets of cards, a set of Science Vocabulary Pictures Set 1 and Math Vocabulary Pictures Set 1. The cards are designed for use with elementary aged children up to middle or high school (the sets I reviewed were geared for grades 3-8). The site has a preview of the word list for each set so you can choose the correct set based on the ability level of your student. Science Vocabulary Pictures retails for $29.99. Math Vocabulary Pictures retails for $29.99. I received the Science Set 1 cards in the large size. There were about 40 cards in this set. I also had the chance to review the Math Set 1 in the small size. There were about 50 cards in this set. Each set comes with a glossary that lists each word and a simple definition. How did we use these cards? We review memory work every morning at breakfast. This memory work includes poems, Scripture, catechism, and definitions of words from various subjects such as science, history, math, and language arts. I decided to incorporate these learning cards in during our memory work time. I placed the cards in sheet protectors in our memory work binder and we reviewed one or two cards a day. I would show Curly the word card and have her read the word. Then we would talk about what she thought the word meant. Then I asked her to use the picture clues to determine the meaning. Then we discussed the definition and how the pictures would help her remember that definition. We had some great conversations about word meaning. I went through all the cards beforehand and chose the topics and terms that I thought she would be more familiar with. Some cards covered topics that we weren’t quite ready for (especially in the math cards) but many of them were easily understood by Curly. Tiger even listened in and he picked up quite a few definitions as we worked through the cards. Curly enjoyed spreading the cards out and reviewing the ones she knew and trying to guess the meanings of new cards. We also used the cards for the “word of the day,” choosing one word for that day and we tried to use that word throughout the day or find examples of that term (such as for parallel and perpendicular). And if I was super creative, I would have created a game to play with the cards. I think I might create a matching game for her now that she knows several of the cards. I will type the definitions on cardstock and cut them out. She will have to match the definitions to the correct term. The definitions of each of the words is not on the back side of the cards. Rather, the definitions are printed on paper that is included with the card set. This paper is hard to keep track of and is printed on regular paper instead of heavy cardstock. I would have preferred the definitions be on the back of each card so I could easily reference them. Because, if I was being honest I would admit that I lost that little piece of paper more than once. Frustrating! I would have loved if the cards were laminated and had a hole punched in one corner so they could be hung on a ring. This would have allowed me to keep the set together without worrying about losing a card. Lamination would also protect the cards. We like to do our memory work at the kitchen table during meal time which can make for some messy memory work pages if they are not protected-hence the abundance of page protectors in my house. The cards are brightly colored with clear illustrations and a large font. Curly was able to easily read the words and the pictures clued her in to the meaning. She enjoyed the illustrations and liked to try to figure out the meaning of the words based on the pictures-without me giving her any hints. Some of the illustrations are very clever and really helped her remember the meanings. I love these picture cards. The pictures on the front really helped Curly remember the meaning of each term and she had great retention after using them for several days. The cards illustrated the vocabulary words well and even helped me remember them. These cards are great for kids of any age and would be hugely helpful for visual learners. We’re excited to continue using them during our memory work time and I plan to purchase the Latin cards when we study Latin. What did other Crew Members have to say about Lone Star Learning?? Check out the list of reviewers here!